The African Export-Import Bank (Afreximbank) has in place many programmes which can support Tunisian businesses that are trying to extend their activities into other African countries, Kanayo Awani, Managing Director of the Bank’s Intra-African Trade Initiative, has said. Speaking in Tunis today during a panel discussion at the Financing Investment and Trade in Africa (FITA) conference, Ms. Awani noted that the Bank had recently announced a $500-million Tunisia-Africa Trade and Investment Promotion Programme, which will support Tunisian businesses trading with the rest of Africa, and had approved $300 million for six Tunisian banks under its Afreximbank Trade Facilitation Programme. In addition, it was considering reopening its Tunis-based Regional Office for the Maghreb Region in order to revive trade flows between North Africa and the rest of the continent and to be nearer to Tunisian businesses. Ms. Awani highlighted the importance of the Bank’s payment and settlement platform, planned to be launched soon, which would enable businesses to make cross-border payments in local currencies. She also referred to the various guarantee programmes available through the Bank which the businesses could take advantage of to mitigate the risks they could encounter in doing business in other countries. Ms. Awani was part of the delegation led by Afreximbank President Prof. Benedict Oramah to the FITA conference. Other members of the delegation were Amr Kamel, Executive Vice President, Business Development and Corporate Banking; Obi Emekekwue, Director and Global Head, Communications and Events Management; Richman Dzene, Special Assistant to the President; Jacqueline Clarisse Motsebo of the Legal Department; Dr. Abdel Aziz El Marzougui of the Strategy and Innovation Department; and Ayman El Zogby of the Intra-African Trade Initiative. 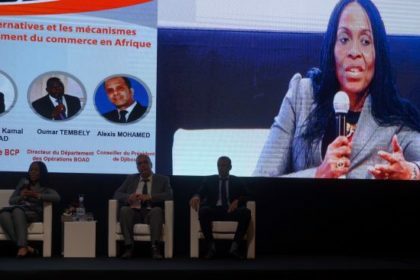 The two-day FITA conference, which was organized by the Tunisia-Africa Business Council, took place from 5 to 6 February.